A day after online cab aggregator Ola submitted a 15-page-long affidavit levelling a handful of allegations against rival Uber, the San-Francisco-based outfit responded by saying it is a global company with local roots and is as foreign as Ola. In a blogpost authored by its general manager, operations, Bhavik Rathod, the company said: "Uber has the deepest respect for the laws of India. What makes Uber 'foreign'? The fact that we are established in San Francisco but have a hyperlocal team solving problems that are locally relevant? Or that, just like our competitors, we received most of our funding from 'foreign' investors?" The blog posted on Uber's web site came in response to Ola submitting an affidavit to the Karnataka High Court on Tuesday in which it alleged that Uber was a "foreign" company profiteering through bypassing the laws of the country. Ola also alleged that Uber was indulging in murky business ethics and had no regard for customer safety. The development comes after a court hearing on a petition filed by Uber in which it challenged new rules announced by the Karnataka government that included a ban on surge pricing and a cap on fares. The case came up for hearing on Tuesday. While it was not clear what transpired at the hearing, a spokesperson for Uber said that the court hearing had been adjourned till July 2. In its affidavit to the court, Ola had claimed that it is an indigenous company that grew in leaps and bounds due to its revolutionary business model, business ethics and respect for laws. Ola went on to say that the petition filed by Uber was probably an attempt to bypass the laws of the land by foreign companies which ran their operations in the country for profit while disregarding the law of the land. "In the affidavit submitted by our competition, they have not commented on the regulations and are silent on the subject matter of the petition. However, they have chosen the Hon'ble Court as an avenue to level false allegations while not taking a stand on whether it supports or objects to these regulations," said Rathod in his blogpost. He said regulations stipulated for the cab aggregation space by the state government were in contradiction to the reputation that Bangalore had as the startup capital of India and as a pioneer in adopting and accepting new disruptive technologies. "Regulations should enable and not thwart a nascent industry that is shaping future mobility in cities across the world," said Rathod. In response to Ola terming its Ubermoto operations illegal, Rathod said that services involving autos, shuttles and bikes may be unregulated and termed illegal right now, but they held promise in serving the city's transport needs. "The need of the hour is for the government to acknowledge the value that disruptive businesses bring and formulate regulations that maximise consumer benefit while helping our cities," said Rathod in his blogpost. In May this year, Uber, which showed about 140 cars operating on its platform as part of the licence application process under the new Karnataka On-Demand Transportation Technology Aggregators Rules, 2016, found itself facing a roadblock when the regional transport officer concerned refused to accept its documents citing shortcomings and failure to compliance. Subsequently, after a lot of deliberations, Uber last week received a direction instructing it to submit itself for inspection, a process which it had undergone earlier, to an RTO under a different jurisdiction. When I launched Uber in Bangalore in August 2013, our first city in India, all I was focussed on was to transform the way we move in our city using technology. It all started with a hyperlocal team of three (see pic above) who were really passionate about the city - just like in any of the other 400+ cities Uber is present in globally. At Uber, we celebrate cities - we're a global company with local roots where we keep our customers first - riders and drivers. There has been a lot of talk about the Karnataka On demand Transportation Technology Aggregator Rules, 2016 that were recently released. As I read through them, I couldn't help but think about the reasons why we picked Bangalore as the first city to launch in India. The startup capital of India has a reputation of embracing disruptive technology. 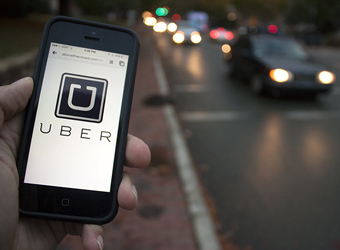 Regulations for our sector reflect how governments are embracing the value that Uber brings. At the same time, these regulations need to enable, not thwart a nascent industry that is shaping future mobility in cities across the world. It's equally important that we work together with the government to help meet legitimate regulatory requirements that will support the future of mobility. However, it's unfortunate to see the turn that this industry has taken today. Instead of rising above differences and helping build the future of this sector, it's disappointing to note how baseless allegations are being levelled to confound and complicate matters. In the affidavit submitted by our competition, they have not commented on the regulations and are silent on the subject matter of the petition. However, they have chosen the Hon'ble Court as an avenue to level false allegations while not taking a stand on whether it supports or objects to these regulations. Uber has the deepest respect for the laws of India. What makes Uber 'foreign'? The fact that we are established in San Francisco but have a hyperlocal team solving problems that are locally relevant. Or that, just like our competitors, we received most of our funding from 'foreign' investors. As required, Uber has submitted details for 100 cars to obtain the license under the current regulations. But for reasons unknown to us, we're yet to be granted the license and have instead been asked to undergo the same process all over again with another local authority. Despite this, we are acutely aware that such a license which only provides a license for 100 cars and leaves out the vast majority of other cars (estimated at close to 100,000), is not the level playing field that government seeks to create. This is also precisely why Uber has moved court. Products like Autos, Shuttles and Bikes may be unregulated and termed illegal right now but hold promise in serving the city's transport needs. The need of the hour is for government to acknowledge the value that disruptive businesses bring and formulate regulations that maximise consumer benefit while helping our cities. We are a law abiding, for-profit company and that is why it matters that the new laws being framed for a new sector like ours take into account the innovation and change that technology has brought to the industry. It matters to us that the laws that are getting framed give riders the choice and drivers the opportunities that make them better off. It also matters to us that regulations apply equally to all. It's not about 'bypassing laws of the land' but it's about building for tomorrow by participating today - so we don't stifle the innovations that is surely coming to us tomorrow. At Uber, we believe in celebrating cities - each of the city that we build ground up, every decision taken with the best interest of our riders, drivers and cities in mind. In this safety is paramount and our technology makes it possible to focus on safety for riders and drivers before, during, and after every trip in ways that were not possible before smartphones. We have full faith in the Hon'ble High Court and also in the senior leadership within the government of Karnataka. We are very hopeful of a positive outcome to this and look forward to progressive regulations to govern the entire aggregator industry.